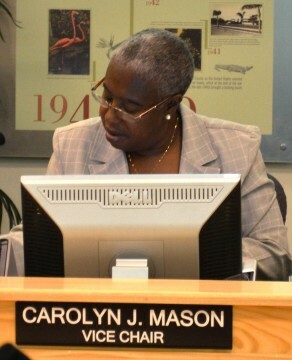 On two occasions, almost exactly three months apart, Sarasota County Commissioner Carolyn Mason was the swing vote for a decision affecting one aspect of the commission’s decision to allow a broader range of commercial uses within major employment centers (MECs) in areas zoned Industrial Light Warehouse. On May 23, Mason joined fellow Commissioners Nora Patterson and Jon Thaxton in opposing the expansion of that change beyond the county’s Urban Service Boundary. On Aug. 22, Mason joined fellow Commissioners Christine Robinson and Joe Barbetta in agreeing that the change should be applicable to the two MECs that previously had been excluded off Fruitville Road. One of the two people who offered public comments on Aug. 22, Robert T. Medred of Genesis Planning and Development in Sarasota, had urged the commission to take just such action. In voicing her support for the proposed comprehensive plan change during the May discussion, Chairwoman Robinson had said what had swayed her were the problems she had heard about workers in MECs “getting their daily business done.” Company officials also had told her, she said, that the lack of retail support services in MECs was seen as a hindrance in attracting employees. “I believe [the comprehensive plan change] will enhance our ability to attract workforces,” Robinson added. Lobeck also pointed to comments by Patterson in May, indicating her approval of the amendment “to prevent big-box commercial retail development” in an ILW zone. He said he hoped the vote in August would be the same as it was in May. According to staff memos provided to the County Commission, the public initiative to change the comprehensive plan began formally with a public workshop on Sept. 27, 2011. Stakeholder group meetings were held in October 2011 and again in February, with a public workshop on Feb. 21. When the Sarasota County Planning Commission addressed the proposed comprehensive plan change during its April 5 meeting, the board voted 4-2 to approve it. The comprehensive plan change would allow a broader array of freestanding commercial uses, which would be limited to 15,000 square feet per building. Freestanding retail commercial buildings larger than 15,000 square feet could be approved by special exception. However, the Planning Commission recommended a maximum building size limit of 40,000 square feet for commercial uses, allowed by special exception, be specified for ILW-zoned properties within MECs. Four speakers during the May 23 public hearing before the County Commission were split on whether the comprehensive plan should be changed as proposed. Lourdes Ramirez, president of the Sarasota County Coalition of Neighborhood Associations, joined Lobeck in pleading with the commission to forgo it. Medred and Robert Waechter, a former chairman of the Sarasota County Republican Party, urged the commissioners to proceed with the change. After the public hearing, Barbetta made the motion to approve the county staff recommendation for the change, without the 40,000-square-foot cap suggested by the Planning Commission. Existing zoning code language already specified a 60,000-square-foot cap that would apply in such cases, he said. Then Thaxton proposed the amendment for limiting the change to the qualifying MECs in the Urban Service Boundary, saying he felt that was appropriate. Patterson seconded the motion, with Mason joining them in passing it. The motion, as amended, passed unanimously. After the vote, staff sent the amendment package to the Florida Department of Economic Opportunity and other state agencies for review and comment. Allen Parsons, planning manager in the county’s Planning Services office, told the commission on Aug. 22, “We did not get any significant comments, objections or recommendations” from those agencies. Therefore, he said, the matter was back before the board in August for formal adoption. Parsons explained, as he had in May, that the amendment would allow for increased redevelopment opportunities within ILW-zoned properties, located within MECs as of Jan. 1. In his public comments on Aug. 22, Lobeck also referenced a comment Robinson had made in May: “You have to have reliance on the elected officials to make the right decision” about future development. Before the Aug. 22 vote, Patterson asked Parsons for clarification about whether a special exception would allow big-box commercial development in an ILW. He said that was correct. Retail sales development larger than 60,000 square feet could be allowed by special exception in ILW-zoned areas. Parsons reiterated that a special exception was needed for any freestanding retail commercial building in an MEC in an ILW zone that was larger than 15,000 square feet. Parsons also pointed out that the entire county had only about 6,000 acres in MECs, and about 1,400 of those acres — 24% — are in ILW zones. Finally, only about 600 of those latter acres have frontage on major arteries. “That’s good information,” Patterson told him. “It’s good information as long as the date maintains itself in the plan,” Thaxton interjected, referring to the Jan. 1 effectiveness date for the MECs to be included in the comprehensive land change. After Robinson closed the public hearing, Mason made the motion to approve the amendment without the reference to the Urban Service Boundary. Barbetta seconded the motion. It passed 3-2, with Robinson joining Mason and Barbetta in the majority. 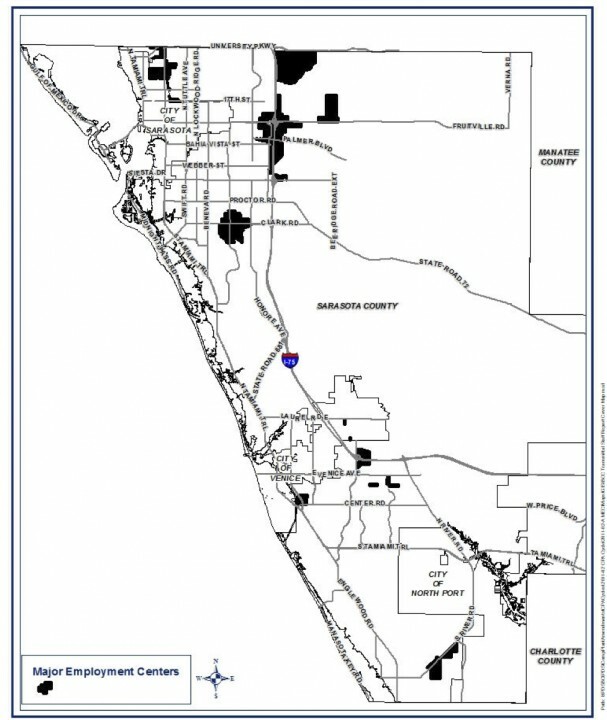 A Sarasota County map shows the existing major employment centers in the county.